Home Blockchain Dispatch Mainnet is Live: What does the Dispatch Protocol do? Dispatch, a revolutionary decentralized data protocol, launched in December of 2018 amidst much fanfare. Following the launch, the chief technical officer for the project Zane Witherspoon released a blog post detailing the operation of the Dispatch protocol as well as its numerous benefits. What does the Dispatch Protocol do? Dispatch protocol is basically a technology that allows entrepreneurs and enterprises to create decentralized applications (DApps), particularly those with a focus on data. He noted the three main components of the Dispatch protocol—two networks and a uniting virtual machine—namely, the Dispatch Ledger, the Dispatch Artifact Network (DAN) and the Dispatch Virtual Machine (DVM). Artifact as used refers to data stored on the network which can be structured data like the sql data or binary big objects like PDFs and video files. 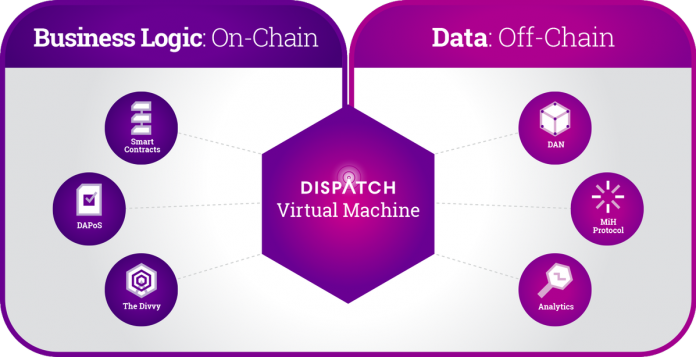 Just like the public blockchains of Bitcoin and Ethereum, Dispatch has the Dispatch Ledger which hosts smart contracts and uses a Delegated Asynchronous Proof of Stake (DAPoS) consensus algorithm. The second network, the DAN consists of “data farmers” who accommodate huge bulky data. The two distributed networks are combined by the DVM which is similar to the Ethereum Virtual Machine. An attractive aspect of the dispatch protocol is that it is a transaction-free system. Witherspoon explained how they were able to eliminate transaction fees which are a constant in other DLT protocols. Transaction the fees are usually collected by blockchain networks to compensate validators for putting transactions in the ledger and to prevent spam on the network. According to him, the Dispatch protocol pays network validators a time-based salary using tokens minted out of the protocol. According to the Dispatch whitepaper, the protocol can be applied in a wide range of industries including peer-to-peer Content Marketplace, medical industry, manufacturing, management systems and powering token sales. Content markets created on Dispatch protocol will allow content creatures have control over their data and determine their earnings for their content. Unlike in centralized systems, content creators can keep 100 percent of their earnings through Dispatch’s fee-less system. Following its mainnet launch, the Dispatch team is attracting DApp developers to create data-centric applications which will compete with centralized solutions. In a New Year address, Witherspoon announced that the first DApp that launched on the mainnet, PureLand has reached 1000 users—a decent number for a new decentralized application. According to him, security audits of the protocol has been concluded and the development team are working on back-end functionality of the system as well as its usability.